The woman who would become "Chicago's Quilting Queen" was born in 1891 to a tailor, Max Sheramsky, and his wife, Frances. Bertha grew up and attended school in Alameda, California, where friends and family remembered her love of arts and crafts. She attended the San Francisco School of Art and designed stained-glass windows. By 1910 she had her own studio adjacent to her parents' house and, although only nineteen, was listed in the census as an artist. Two years later, Bertha moved to Chicago, where she married Bernhard Stenge, a young lawyer recently graduated from Northwestern University. Bertha and Bernahard lived on the Near North Side of Chicago for forty-five years and raised three daughters, Frances, Ruth, and Prudence. Bertha Stenge made her first quilt in 1929, while recovering from an illness. She used the Grandmother's Garden quilt pattern series published in the newspaper's Nancy Page syndicated quilt column. She entered the local contest for the best quilt using this pattern and won the $25 second prize. Thus encouraged, Bertha began entering and winning more contests. In 1933, she entered the Sears Roebuck & Co. national quilt contest for the Chicago World's Fair, which offered a $1,000 grand prize, with a bonus of $200 if the quilt expressed the theme of the fair. Bertha completed her original design based on Chicago's history in just four months and won an award of merit, but no cash prize. Bertha went on to make other album quilts, including One Woman's Life (1941), The Quilt Show (1943), Map of Canada (1947), American Holidays (1948), and Ladies of Fashion (1952). The Sears contest affected Bertha Stenge's quiltmaking style in a significant way. It was at the 1933 Chicago World's Fair that she first saw a quilt with trapunto quilting, Margaret Rogers Caden's Star of the Bluegrass, which won the grand prize. The following year, using a pattern called Palm Leaf, she rearranged the usual layout to create a central diamond space and added elaborate trapunto designs. This quilt brought her a first-prize ribbon at the Women's Pageant of Progress in Chicago in 1936 and the grand prize at the 1940 New York World's Fair. Bertha produced several more quilts with original trapunto designs, including three quilts that appeared in the November 1940 issue of Ladies' home Journal: Rachel's Wreath (1935), Iva's Pin Cushion (1936) and Ruth's Ring (1937). The captions read, "New Quilt Designs: Modern-looking quilts in their restraint, the pattern of their quilting and the pastel shades of the appliqué motifs." For just ten cents, readers could buy a pattern for one of Bertha Stenge's "modern quilts." In 1941, Eugene Neuhaus, her art teacher from her student days in San Francisco, took note of her prizewinning quilts and proposed a one-woman exhibit at the art gallery of the University of California at Berkeley. 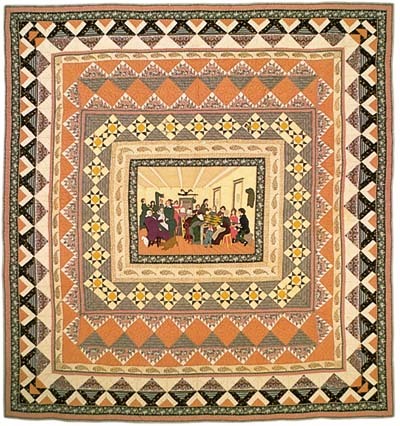 Bertha sent thirteen quilts, including her most recent pictorial, One Woman's Life, which Neuhaus praised for its "symbolic representation of the life of the artist." In 1942, the staff at Woman's Day magazine announced its national Needlework Exhibition in New York City, in conjunction with the Nineteenth Annual Women's International Exposition of Arts and Industries. To qualify for the grand prize of one thousand dollars, each entry must have won a prize at a county or state fair. Bertha Stenge entered her Victory Quilt and her Peace Quilt, which had won prizes at an Illinois county fair. The awards ceremony was held in Madison Square Garden in New York City, while an audience of thousands listened on the radio. Bertha's Victory Quilt, with a theme appropriate to wartime and her signature trapunto quilting, won both the one-hundred-dollar prize for appliqué and the one-thousand-dollar grand prize for best of show. Her Peace Quilt won a third-place twenty-five-dollar award in the quilting category. When asked what she planned to do with her winnings, she patriotically responded that she would purchase war bonds. Bertha Stenge was on hand to accept the prizes for her quilts. Photographs of the quiltmaker receiving the prize checks appeared in the February 1943 issue of Woman's Day, and the following month, a color photograph of her Victory Quilt was featured in the magazine. The wire services sent the photos of Bertha and her winning quilts to newsrooms throughout the country. The hobby that started when she was ill and confined to bed made an interesting story. She was a mother, a Red Cross volunteer, and a prizewinning quilter, but also a trained artist who was astutely tuned in to the judge's standards. With the national spotlight on a Chicago resident, the Art Institute of Chicago filled two galleries with an exhibition of her quilts in the summer of 1943. Florence Peto, a prominent collector and antiques writer, read about Bertha Stenge and decided to seek her out. The two women entered into a long friendship, opening new opportunities for each other. 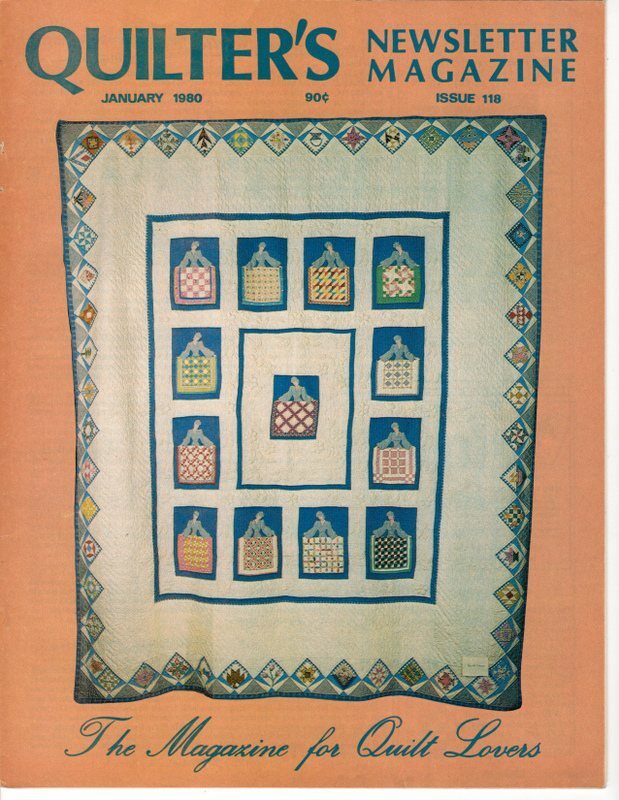 In September 1947, American Home magazine featured quilts by both Bertha Stenge and Florence Peto in the same article. Bertha often sent quilts by mail to Florence for her to use in her exhibits, lectures, and publications. Florence included Bertha's The Quilt Show in her 1949 book America's Quilts and Coverlets as an example of a modern quilt. Florence also proposed that modern quiltmakers should reflect the heritage of American antique quilts by using vintage fabrics and the center medallion format. Although Bertha was not easily persuaded, she eventually acted upon Florence's suggestions to create three of her most memorable quilts- The Quilting Party, made in 1950; Toby Lil, made in 1951; and Ring and Dove, made in 1952. In turn, Bertha introduced her friend Florence to the joy of entering contests, sharing quilts with an appreciative audience, and winning ribbons. The two regularly sent quilts to contests in Florida, Kentucky, Missouri, and Tennessee, and then commiserated with each other over the judges' choices. 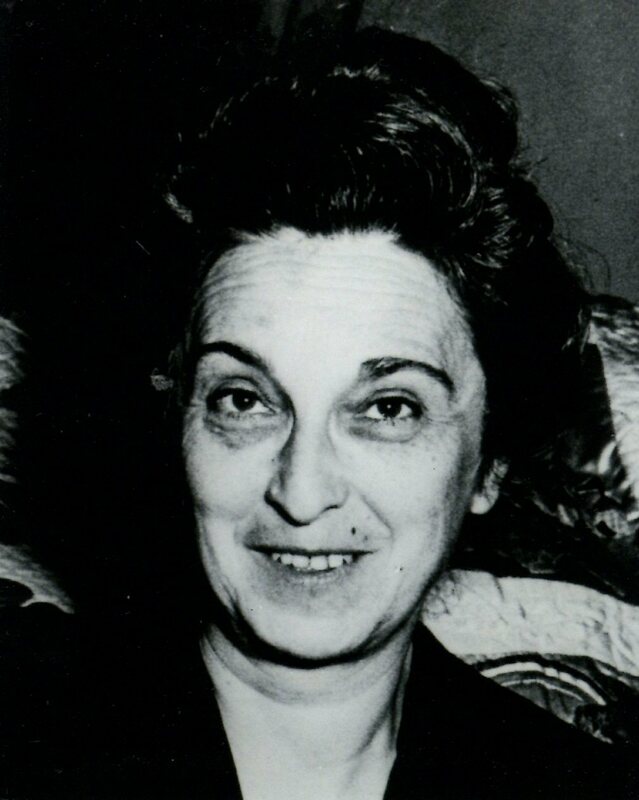 In 1954, the Women's International Exposition honored Bertha with a one-woman show in New York. She exhibited thirty-three quilts and took advantage of this opportunity to visit Florence. These two good friends, brought together by their love of quilts, were both inducted into The Quilters Hall of Fame in 1980. Bertha Stenge died June 18, 1957. Five months earlier, she had donated her Chicago Fair quilt to the Chicago Historical Society. Her daughters each received thirteen quilts, and the Art Institute of Chicago received her collection of vintage fabrics. Later, her Lotus quilt was purchased by the Quilt Conservancy. In 1996, Victory Quilt and The Quilt Show were acquired by the Art Institute of Chicago, and seven quilts, including Quilting Party and Four Freedoms, were acquired by the Illinois State Museum, which organized a touring exhibit with additional quilts, A Cut and Stitch Above: Quilts by Bertha Stenge from the 1930s-1950s. In 1999, two of Bertha Stenge's masterpieces, The Quilt Show (c. 1943) and The Quilting Party (1950) were selected by a panel of experts for America's 100 Best Quilts of the 20th Century exhibit and the accompanying book, securing Bertha's prominent place in quilt history. Barber, Rita Barrow. Somewhere In Between: Quilts and Quilters of Illinois. Paducah, KY: American Quilter's Society, 1986. Gross, Joyce R. "Bertha Stenge." Quilters' Journal 2, no. 2 (Summer 1979): 1-5, 7. ------. "Four Twentieth-Century Quiltmakers." Uncoverings 1980. San Francisco: American Quilt Study Group, 1981. Reprinted in Quiltmaking in America: Beyond the Myths. Nashville, TN: Rutledge Hill Press, 1994. Waldvogel, Merikay, and Barbara Brackman. Patchwork Souvenirs of the 1933 Chicago World's Fair. Nashville TN: Rutledge Hill Press, 1996. Waldvogel, Merikay, and Jan Wass. "A Cut and Stitch Above: Quilts by Bertha Stenge." The Living Museum/Illinois State Museum 59, nos. 1 & 2 (Spring 1997): 10-13.